One day until Easter and the order of the day is Snapshot Saturday, the link up created by Alyce at At Home With Books. Be sure to visit there when you are finished here to see what everyone has to show you! One of my favorite things in Spring is the appearance of the first Spring flowers. Since I was away, then here and very sick at the same time that more cold weather rolled in, I never got to share with you my favorite flowers. Crocuses! I like them especially because the ones in my yard were ones my Grandmother planted many, many years ago. The fun thing about the crocuses is that over the years, they’ve migrated. Well, I guess I should day they’ve been migrated. Many generations of squirrels have dug them up in the mistaken belief that they are acorns. When they realize their mistake, they toss them aside and move on. I’ve actually seen them do this! So the crocuses are not exactly in an organized garden. In fact, they’re all over the place. That’s half the fun. Due to being sick, I missed the opportunity to take any photos of them when they first came up. I was sad. However, today I got my second chance. The first one I found was a white one almost in the middle of the yard…at least 10 feet from where it should have been. The second one was tiny and purple. This one was harder to see and I might have missed it if Ralph hadn’t spied it. This one was at least 15 fee from where it should have been, under a bush and almost buried under left over leaves. Now that I’ve actually documented the fact that there are flowers in my yard, I almost feel like Spring is here! Be sure to visit At Home With Books and see what everyone else has shared. ahhh! love seeing the sign of spring, fran! too funny re the migrating flowers….at this point, we are just so glad to see blooming flowers, it matters not WHERE in the yard they are, right?! we had a gorgeous day here yesterday – hope flowers pop up soon around here, too! Thanks, Cathy…you’re right…I just want to see the flowers! Hope you have a great day and hope you have a great Easter. You’ll be with your folks, won’t you? Have a lovely day! 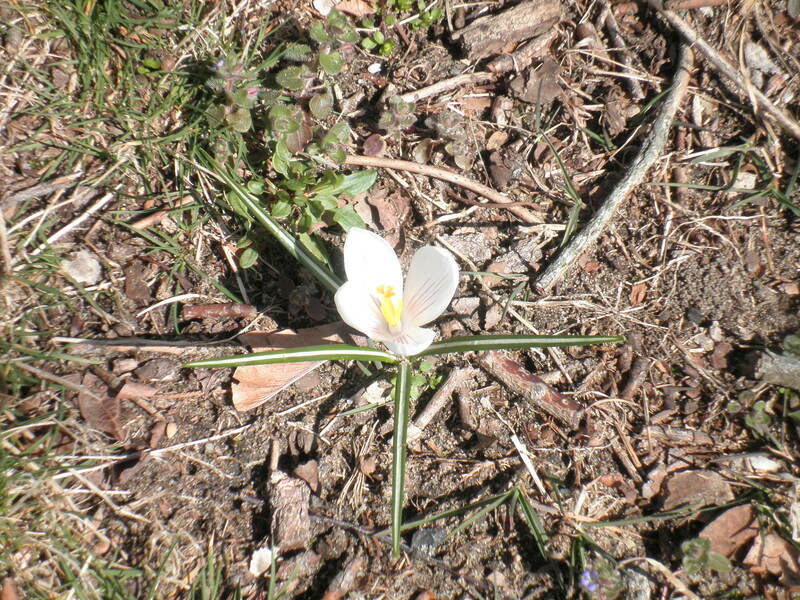 Crocuses are certainly beautiful, and even better when they pop up in unexpected places. I agree, Louise! Have a great day and a Happy Easter! 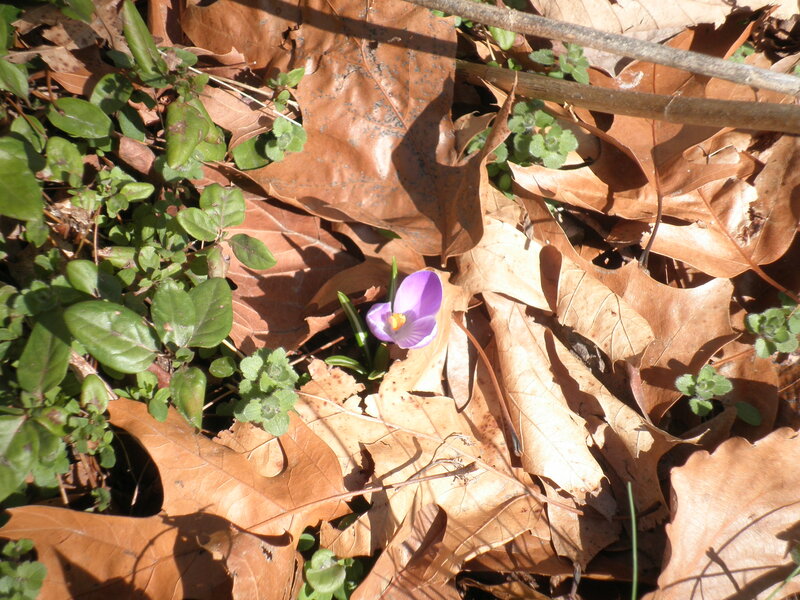 I love the first flowers of spring…and when they seemingly push their way through the soil, it’s triumphant! Thanks for sharing. I love them too, Laurel! Have a great day and Happy Easter! My neighbor sent out pictures of her backyard this week. It’s a field of wildflowers. So beautiful. Wow, she’s lucky to have a lot of flowers, Deb. Maybe later in the summer…Have a great day and Happy Easter! We are not at that “first sign of spring” here in central Minnesota yet – we still have a good foot of snow left. However today is supposed to be a rainy day at about 48 degrees so that may take care of it… of course, there is snow on track for tomorrow. GAH. Poor Sheila! Ralph and I were talking yesterday about remembering Easters with snow. Don’t think we’ll have one this year. Have a great day and Happy Easter! Corrected on my blog to signs of spring, but who knows, maybe they sing too! 🙂 Thanks for sharing your photos. Hi Carolyn! Don’t you hate when you make typos like that…I could kick myself. In our area (NJ) crocuses are usually the first up, followed by the daffodils. Either way, you’re right…they and color and make us feel like spring is on the way! I love that you still have the crocuses that your grandmother planted–even if they have been transplanted by the occasional squirrel gardener! Hi Ali! I would never remove them, until of course it’s time to move to NM, then they’re coming with me!! Thanks, Christine! I love crocuses but I’m frustrated that I missed them when there were more to be had. I’m just glad I’m better now! Thanks for sharing your Spring flowers. I’ve been waiting to spot the first ones here in NJ, but none yet. Hi Jen and thanks for visiting! Just realized I have some daffodils on the other side of the house. I may use them next week. I’m in Southern NJ. Where abouts are you? Those pesky squirrels, my yard is somewhat the same, every spring after they bloom I’m moving them together. Love how they announce spring. Hi Irene! They are just so pretty! I keep saying I’m going to rearrange them but I’m not sure when the best time is to do that and besides, it’s sort of fun discovering where they’ll end up! Happy Easter! I saw many signs of spring in Central Park yesterday! It was a beautiful day. I hope many more like that are coming your way Fran! Thanks, Ameena! Hope you’ve been enjoying NYC!! I love spring and seeing everything come to life, including the flowers in our yards. I actually got outside and into the flower beds twice this weekend and seeing the crocus everywhere made me so happy, so I 100% know how you feel seeing those lovely little signs of hope. I should make time to work in the yard but I just don’t, Meghan. Guess I think, why do anything when we’re going to be leaving. Maybe some potted plants will make it nicer. We’ll see.